The production of biofuels from plant biomass is a highly promising source of energy, but researchers are trying to find microbes that readily degrade recalcitrant lignin found in plant biomass. Recent comprehensive genomic and metabolomic analysis of a known lignin-degrading bacterium provides insight into how this degradation is accomplished. Because the initial step of manufacturing biofuels from plant matter is the decomposition of complex lignocellulose into more manageable "building blocks," an understanding of how nature achieves this is critical. The findings from a new study reveal some of the basic tools used by a specific microbe to break down lignocellulose. This work provides insight into how industrial processes might achieve degradation during biofuel production, and how side processes such as hydrogen production might be harnessed as well. Lignocellulosic biomass represents nearly 90 percent of the dry weight of total plant biomass material, and is a composition of cellulose and lignin. Lignin lends rigidity and rot-resistance to cell walls in wood and bark. It is a complex, cross-linked phenolic structure that makes lignocellulosic-derived biofuels a promising source of alternative energy, provided the recalcitrant material can be degraded and toxic by-products can be managed. Microbial species that grow in environments where carbon is mainly available as lignin are promising for finding new ways of removing lignin that protects cellulose for improved conversion of lignin to fuel precursors. One candidate species that can use lignin for growth in the absence of oxygen is Enterobacter lignolyticus SCF1, a bacterium isolated from tropical rain forest soil. 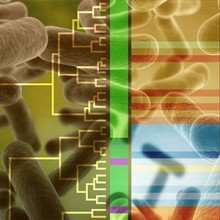 A team of researchers from the University of Massachusetts, Amherst; Santa Maria University in Valparaiso, Chile; and EMSL, the Environmental Molecular Sciences Laboratory conducted whole gene-expression analysis of E.lignolyticus SCF1 using next generation sequencing for transcriptomic analysis. The experiments were conducted on cells grown in the presence of lignin, with samples taken at three different times during growth. Cultures with lignin achieved twice the cell biomass as cultures grown without lignin, and degraded 60 percent of the available lignin. A complement of enzymes consistent with disruption of the chemical structures present in lignin were up-regulated in lignin-amended conditions. Additionally, the association of hydrogen production with lignin degradation suggests a possible value add to lignin degradation in the future.